Shop Electro-Voice SB122 Compact 12" 400 Watt Passive Subwoofer from AMS with 0% Interest Payment Plans and Free Shipping. The Electro Voice SB122 will blow you away! The quest for an affordable subwoofer that is compact, lightweight AND powerful is finally over. Introducing the Electro Voice SB122, quite possibly the smallest, most powerful subwoofer on the planet. Don’t let your eyes fool you into thinking this little sub can’t pound. 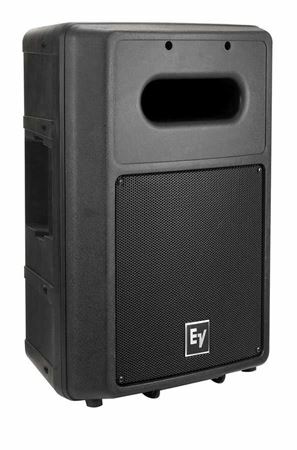 Packing 400 watts continuous (1600 watt peak) in a diminutive 15kg (33lbs) package, the SB122 employs the new EVS12SB 12-inch long-excursion woofer for outstanding low frequency response. The SB122 complements a wide variety of Electro Voice products including, but not limited to, ZX, SX, and even the EVID installation series. I own two EV SB2A speakers that I purchased from American Musical years ago.. I really love them.. They are a powered version of this speaker (they can also power either a top or another sub).. I had decided to try one of these to see the results that I get when using the SB2A to power this sub right next to it and the results are absolutely astounding!! I really think I am going to sell my ELX18P's and get another Sb122 to use with my other SB2A. They are so much more portable and they sound absolutely fantastic together! For the size of these cabinets, you will be blown away with the sound they produce!! Awesome little sub. However, it's made in Mexico. Too but EV pulled its manufacturing out of the USA. This appears to be very solidly put together. I suspect that it will last for quite a long time. The small size and weight are the best features, followed closely by the bigger than expected sound. VERY easy to use. Place it, properly, hook it up, and turn it on. How hard can it be? I REALLY like these, and though they are small for my larger gigs, a pair of them in the corner works VERY well, for medium and smaller gigs. A second pair may be in my future, since four of these will handle more power and move more air than any single 18" woofer, in about the same amount of space and weight. Very well made. E-V quality has always been top-notch. I'd be very interested in seeing a 15" version. I ordered one just to check it out. I now own 4. The output is amazing considering the size. Lightweight and easy to handle, I'd much rather own these 4 than a pair of single 18's. Crossed over at 80Hz, driven by a Carvin DCM2000L, this rig sets up in minutes, takes up very little room on stage, and loads in minutes at the end of the night. On smaller gigs, I use 2, still giving me a solid low end. OK, admit it, aren't there smaller venues where you have to leave the subs in the van but miss the low end? These can tuck in next to a tripod. How cool is that??? There's an internal passive crossover at 160Hz, which I think is much too high. They sound much better down at 100Hz or less. My rig seems to respond well crossed over at 80Hz. Bigger sound than it's package.